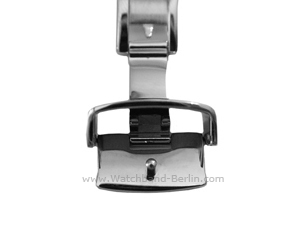 The clasps can also be purchased separately: in this case please browse in the section Watch strap buckles. Our butterfly deployment clasps are made of solid stainless steel. They have two lateral push buttons and two joints. In order to open the clasp, both buttons must be pushed at the same time. We always test our buckles and clasps before sending them. Defective articles do not even leave our store, therefore we can guarantee you a high quality standard. 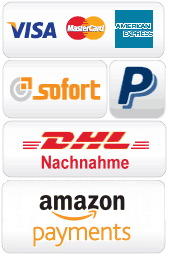 All fastenings are delivered with spring bars. We quote butterfly clasps in the following colours: polished steel, anodized black and gilded (yellow gold). The following widths are available:16mm, 18mm, 20mm, 22mm, 24mm and 26mm. It is important that you measure the width of your watch band at the fastening. 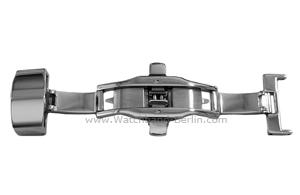 The strap width is not relevant to buy the suitable buckle or clasp and is not conclusive to determine the its width. 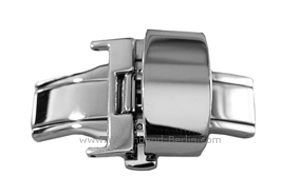 This can vary exceedingly from the watch case to the clasp: a watch band with a 22mm wide fitting can have a buckle width of either 18, 20 or 22 mm. Furthermore, it is necessary to pay attention to the thickness of the perforated side of the strap, which has to conform to the specifications of the clasp. The maximum strap thickness for a butterfly deployment clasp is of 3,5 – 4,0 mm. Thicker watch bands do not fit through the clasp and are therefore unsuitable. The length of the strap is regulated by the pin located on the flap hinged to the clasp. This flap can be folded down. The side of the hinge is easily recognizable through the holes visible when observing the clasp sideways. After finding the right length, the watch band always remains closed. By opening the butterfly clasp, the diameter of the strap gets about 8 cm bigger, thanks to the two joints. This way you can easily fit the strap over the wrist and quickly get on and take off your watch. In order to change the fastening on your watch band, you must start by removing your old one. For this operation we would like to recommend our spring bar tool. 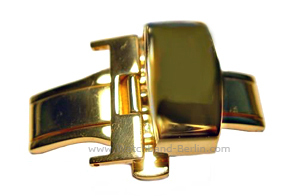 Most buckles and clasps are (like most watch straps), in fact, held in place by spring bars. Changing the clasp is as easy as changing the watch band. 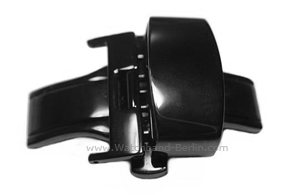 In order to remove the clasp, you must slide the spring bar tool between the fastening and the strap. When the forked end of the tool is placed on the shoulder of the spring bar, only a little pressure towards the middle of the strap will be sufficient to release the clasp. Please note that, if the fastening is held in place by spring bars without shoulders, you will need to work with the pin-end of the spring bar tool, with which you will have to push the spring bar from the side in order to release it. The butterfly deployment clasps available in our shop fit exclusively leather and rubber straps. We do not quote butterfly clasps for metal bracelets, since the specifications in this case must be precise to the millimetre. Our butterfly clasps also fit heavy watches like chronographs, since they are bulky. The term „butterfly“ is due to the fact that this type of clasp opens symmetrically because of its two joints.